IV’s new fund bought 16% of all the packages sold in the first half of 2014. As a follow up to our article “What’s Inside IV’s Patent Portfolio?” we examined Intellectual Venture’s recent buying practices, and in particular, buying for their new fund. 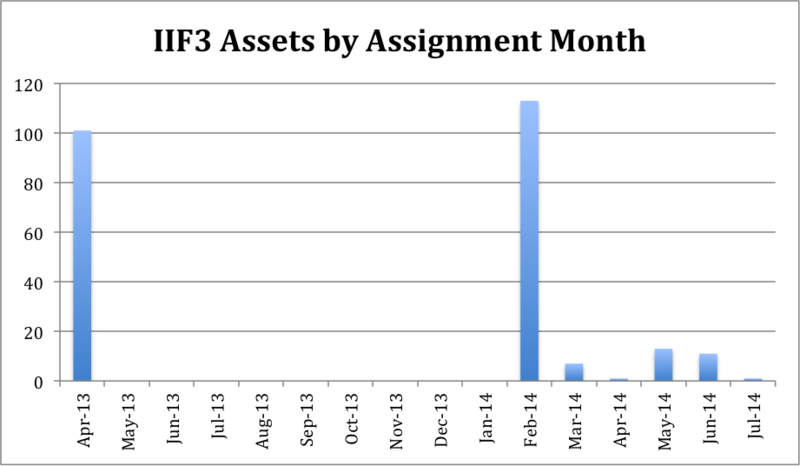 We found 14 recorded assignments to III Holdings 1, LLC; this is IV’s new Intellectual Investment Fund 3 (IIF3). Although there has been speculation in the broader community about whether IIF3 is funded, we believe that these assignments are public evidence of funds committed from IIF3. At the ROL Group we perform quarterly analysis on patent packages offered for sale on the open market. We saw a significant number of packages purchased by III Holdings 1, LLC. RPX has identified this III Holdings 1, LLC as an NPE entity. III Holdings 1, LLC could not be found as a litigant in any patent litigation. However, we have confirmed that this is a holding company for Intellectual Ventures’ IIF3 buying. As for the money IV spent on these assets, an approximation can be made by scaling down the expected sale price to 65% of the asking price, as described in “The Brokered Patent Market”. Using this method, $4.39M of IV spend was identified in the Q1 review and $8.06M in the Q2 review for a total spent of $12.45M. Not anywhere as high as past years, but IV is buying in IIF3. 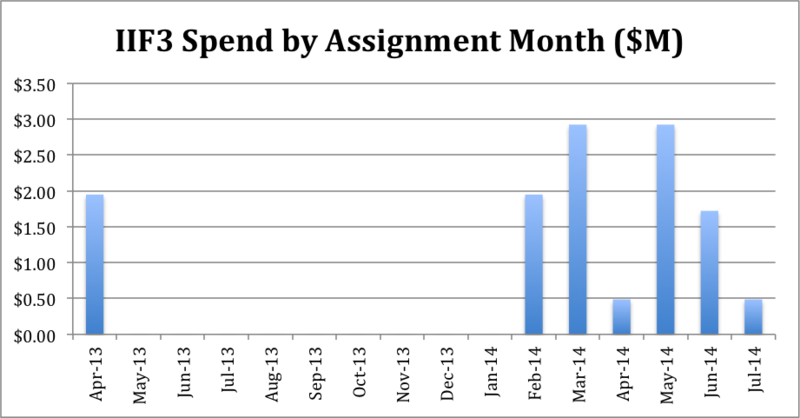 Using the actual assignment dates, the following histogram represents IV’s estimated spend per month on open market patent deals in IFF3 since the first confirmed assignment. Importantly, IV is successful at buying at the low end of the market so the estimated total spend may be high. The flip side, is that private purchases are not reflected above, if private purchases were included IIF3 spending would be higher.